There’s several substitutes for pasta out there and I’ve tried them all. Shirataki noodles, Konjac noodles, and every other ‘miracle noodle’ in between. Tons of people rave about miracle noodles but I haven’t been able to get past the texture and smell that comes with them. I’ve tried boiling the smell out, coating with copious amounts of sauce, and rinsing for ridiculous amounts of time. I just can’t do it. Spaghetti squash has always proved to be a great alternative to pasta but I don’t have the patience to watch something bake for 40 minutes. The day I discovered Zoodles was a great day. Really, really great day. Zoodles are an amazing alternative to pasta. They don’t have a funny texture or smell and can be prepared in under 5 minutes. Yes, that’s correct – under 5 minutes! I often include Zoodles in my Sunday meal prep to get in a good serving of veggies and to ‘volumize’ my meals. The human mind is a powerful thing. Add volume to your meals using low cal foods and your mind will trick you into feeling super satisfied at the expense of just a few calories. While Zoodles are a great pasta alternative for those looking to cut carbs, they’re equally as great for those looking to balance their macros and keep their carbs in check. A pasta dinner with garlic bread would provide me with more carbs than I need or want on an ordinary day. Zoodles and garlic bread, however, balance out perfectly. Now, let’s get started on preparing Zoodles! Spiralizing zucchinis is the quickest and easiest way to prepare Zoodles. 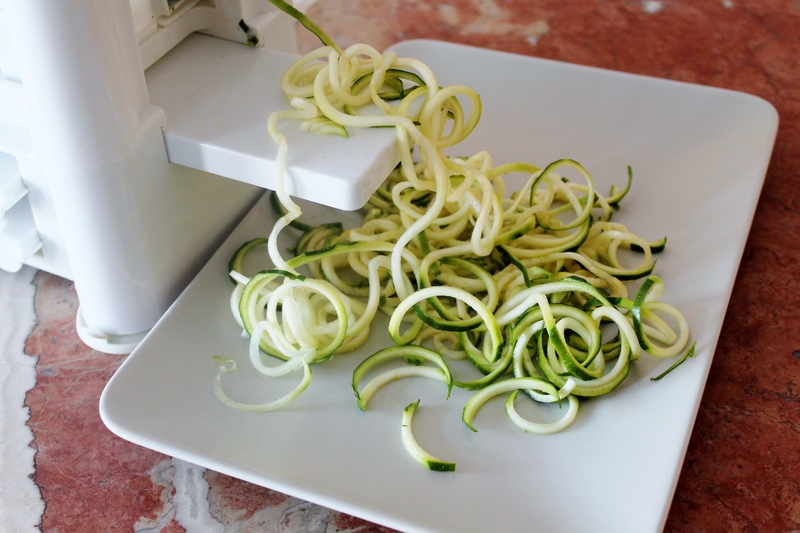 A spiralizer is a good investment if you find yourself eating Zoodles on the regular but not at all necessary. Julienne Peelers are great. You can find them at most department stores for about $4.00. 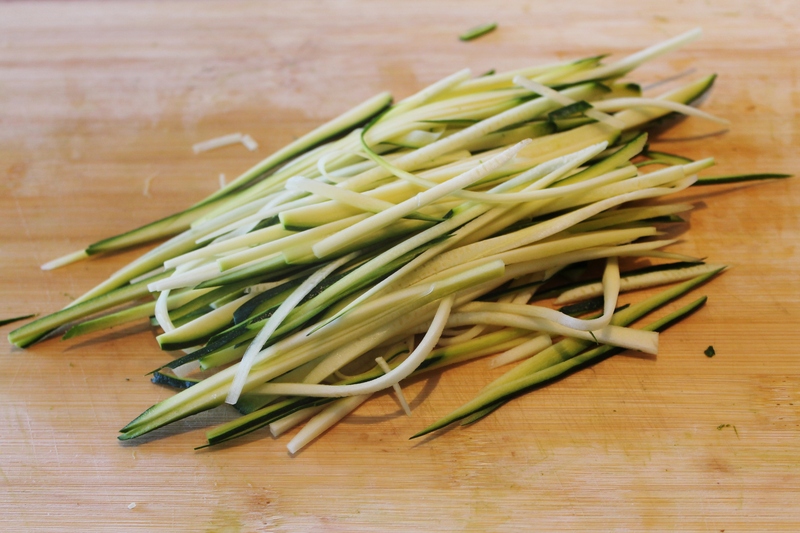 Simply run your julienne peeler along the zucchini lengthwise and you’ll have yourself some Zoodles in no time. 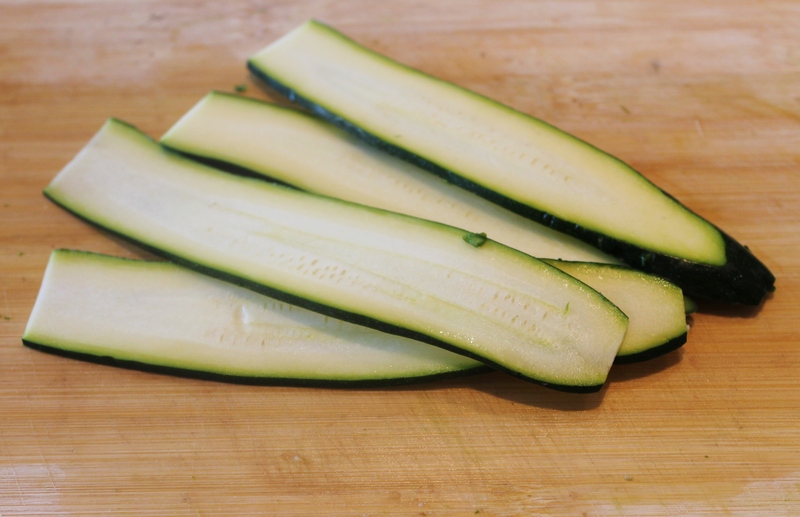 Stop peeling once you get to the core of the zucchini. A Sharp Knife will do just as great of a job as spiralizing or using a julienne peeler. 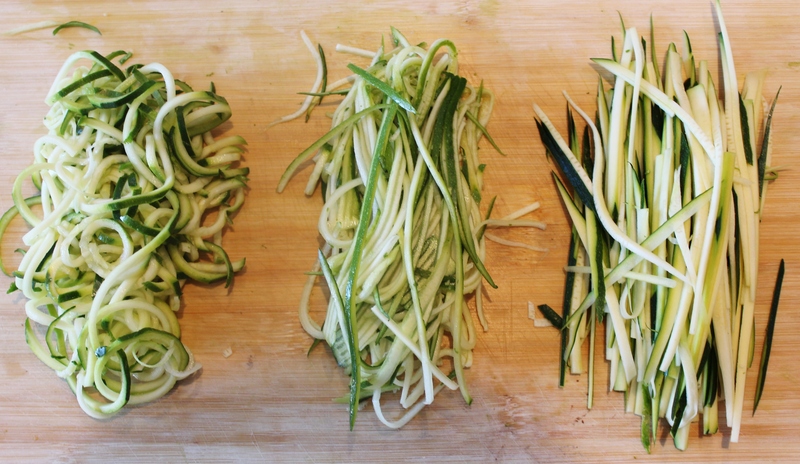 Cut the zucchini in thin slices (lengthwise) and then cut the slices into individual Zoodles. You can cut them as thick or as thin as you like them. Just make sure to avoid the core as it’s quite soggy. Despite the slight difference in appearance and shape, they all taste great. Once you prep your Zoodles, you can either cook them (see below) or add them directly to your meal containers. The microwave will cook the Zoodles when you reheat your meal. Experiment with this and see what you prefer. Heat a skillet with a small amount of your oil of choice over medium-high. Add your zoodles and cook for 2-3 minutes. Do not overcook your Zoodles! The last thing you want is mushy zucchini. Add your favorite seasonings. My foolproof trio is a pinch of salt, a pinch of pepper, and a pinch of garlic powder. Tastes great every time. If you are adding a sauce to your zoodles, make sure you have reduced your sauce. Any sauce can be reduced by placing it in a sauce pan and heating until water evaporates and it thickens. This is crucial. The high moisture content of zucchini causes them to release water. A reduced sauce + released liquid will create the perfect consistency. Zoodles can be stored in any meal prep container. It’s best to use glass or a BPA-free plastic. How long can I store Zoodles for? I would suggest storing Zoodes for a maximum of 3-4 days. They’re quick and easy to prep so a second mid-week Zoodle prep will keep things fresh all week long. What should I top my Zoodles with? The sky is the limit! Any meat, seafood, or veggies will go great with Zoodles. 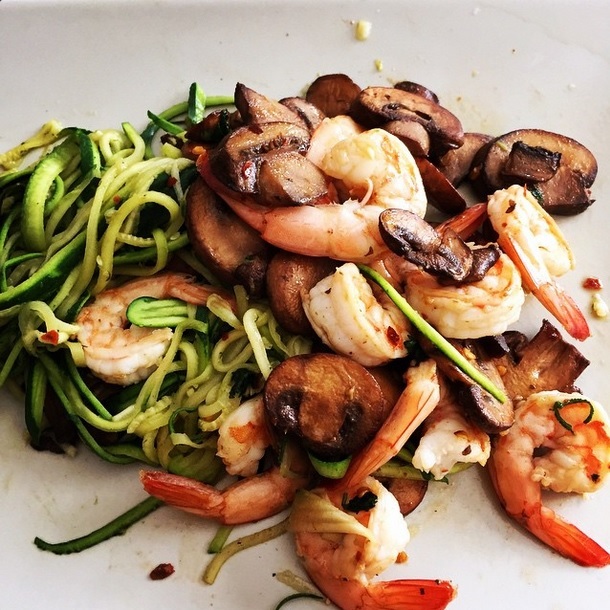 One of my favourite Zoodle recipes is my Mushroom & Shrimp Zoodles. Begin by heating oil in medium sized skill on medium heat. Add minced garlic and cook until fragrant. Add mushrooms and cook until the mushrooms develop a caramel color and have reduced in size. Add shrimp and dry spices and cook until the shrimp is fully cooked. This should take about 3-4 minutes. Remove shrimp and mushrooms from skillet. In the same skillet, add your Zoodles and cook for about 2 minutes. Remove from skillet and plate. If desired, top with fresh Parmesan cheese. Serves 2. < Stay up to date with MealPrepSunday! I’m trying to meal prep zoodles to bring them to work and reheat, how do you not over cook them? 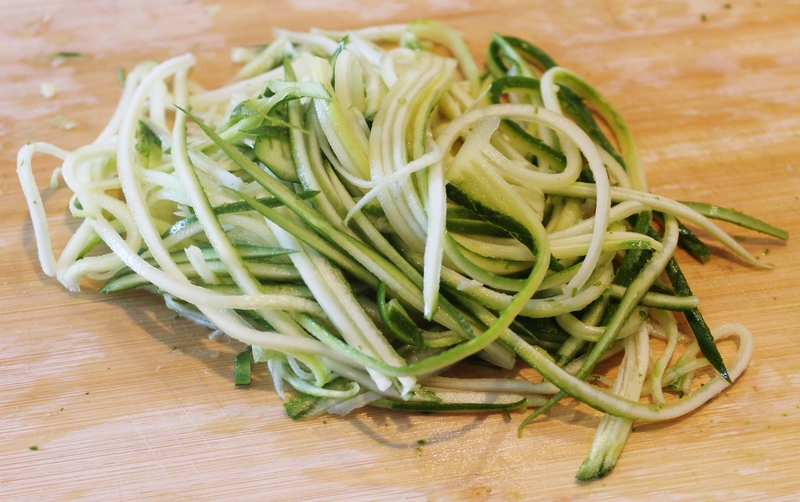 If the zoodles are in some kind of sauce, you could spiralize them and then leave them raw. A couple minutes in the microwave will cook them so that they’re al dente.